Launch: Thursday, August 2nd, 2018, at All Saints Church, Killasser, Co Mayo at 8 p.m. The genesis of this project started with a gathering of family, neighbours, and friends for a house session at the the home of Mary Hanley in Dunmaynor, Killasser on August 20, 2017. Killasser flutemaker Michael Cronnolly presented me with a fully keyed D flute as an unforeseen gift on that evening. His outstanding generosity and neighbourliness was further shown a few days later when Michael also presented me with the additional gift of an F flute. I made him the promise that I would make a recording with them, since this was the only way I could think of to acknowledge his extraordinary kindness. The repertoire for this recording is as local as possible to the parish of Killasser. I planned that ten of the twenty three tracks would feature the music of the Killasser Flute and Drum Band using the Cronnolly F flute (the impetus for Michael becoming a flutemaker in the first place were the childhood memories of the Killasser Band, of which his father Billy was a member). The remaining thirteen tracks would feature the Cronnolly D flute. O'Sullivan Meets O'Farrell Vol. I and Vol. II is now available at CDBaby. on period cello, for whom Boston musician Kevin O'Brien wrote continuo parts. The album consists of four beautifully arranged suites teeming with tunes, plus the concluding Sheeling O Guira; performed as a glistening uilleann pipes solo. The long-deceased, oft-forgotten Mr. O'Farrell comes alive again through the muse and mastery of Mr. O'Sullivan. This second meeting between them is a drop-dead gorgeous recording." "We should all celebrate the fact that someone has finally gone to the trouble of performing and recording O’Farrell’s music for the Union bagpipes. Jerry’s attention to detail, exactitude and sensitivity to the history of these tunes ensures that they will be preserved for future generations, enabling this important musical collection and its history to come to life and remain alive. The subtle differences which distinguish these pieces can be fragile, at times hard to discern, always challenging – but the reward for the educated listener is the joy of knowing that all these subtleties are audibly preserved in a form that all listeners will agree is the most sophisticated and tasteful rendering possible, featuring pipes accompanied by harpsichord and cello." 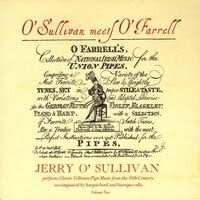 "Jerry O'Sullivan's long-standing excellence on the uilleann pipes is celebrated globally. His style is the outcome of many influences, but what makes his uilleann piping unique is how effectively he integrates those influences with his own personality, taste, invention, and sense of wonder. Grateful for the guidance and support he's received in the past, Jerry is also dedicated to passing on the instrument's beauty and intricacies through teaching." 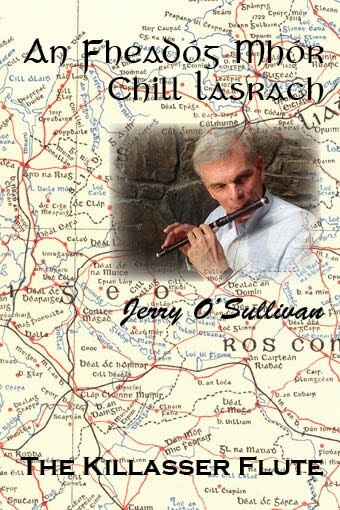 "Jerry O'Sullivan is a gifted ambassador of the Irish uilleann pipes, maintaining the historic traditions and melodies of the instrument while expanding its range into new genres of music and media. His mastery of the instrument, traditional knowledge, versatility, and dedication to education truly make him America's premier uilleann piper."